Chow Tai Fook Jewellery Group Limited ("Chow Tai Fook" or the "Company," collectively with its subsidiaries, the "Group"; HKEx Stock Code: 1929), the largest jeweller listed in Hong Kong by market capitalization with 87 years' heritage, showcased 3 sets of one-of-a-kind exclusive auction pieces from the fifth High Jewellery Collection "Le Labyrinthe Artistique" in Las Vegas. This would be the first-ever preview in the United States which is backed by the brand's recognition of the U.S. as an international jewellery hub and its foresights in penetrating the U.S. market. Inspired by the great abstract artists, each unique piece is a celebration of iconic geometric oeuvres of the Modern Period. As Chow Tai Fook's first collection inspired by the fine arts, "Le Labyrinthe Artistique" also marks the company's latest milestone in its continuing journey as a leading world class jeweller and brand. Chow Tai Fook seeks to constantly elevate its High Jewellery series to new heights with its wealth of experience in world-class design, materials selection, and exquisite craftsmanship. The masters have channelled a distinct aesthetic into each unique piece, which were showcased at this exclusive event, offering a platform for sharing with privileged guests the brand's ethos as a jeweller: the relentless pursuit of perfection. 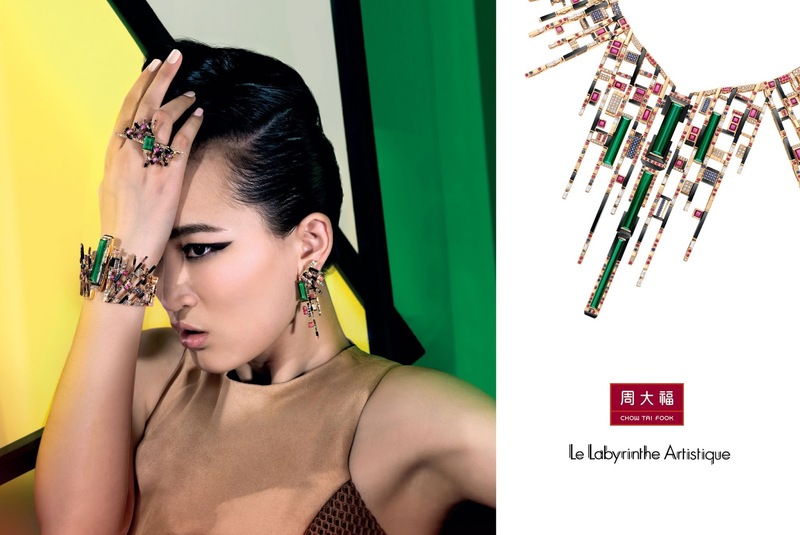 This year, with "Le Labyrinthe Artistique," Chow Tai Fook has distilled the very essence of these artists' works and given them new form through our unique interpretation and exceptional craftsmanship. The collection of 15 sets of jewellery presents an abstract maze in which color, form, and dimension unite in homage to the titans of abstract art. Les Blocs de Fantaisie (Piet Mondrian): The ordering principle of this arresting work is linearity: The minimalist pieces pare down form to an entirely flat plane where only the sharpest of lines and the rectangular remains. As with Mondrian, color and space work in perfect harmony to draw the eye to a shock of bright green tourmaline at the centre of each piece. Surrounding them are iridescent blocks of rubies, sapphires, diamonds and chalcedony outlined in a stunning grid lined by 18K yellow gold. The representation of the three primary colors whimsically conveys shimmering movement to project a sense of modern chic. Le Glissement du Flamant Rose (Alexander Calder): This series extends the vision of Calder by creating suspended three-dimensional works. Inspired by the floating "wings" of Calder's masterpieces, this series soars to new heights with the iconic visage of flamingo, the signature motif in Chow Tai Fook's high jewellery collections. The flamingo's flamboyance is portrayed through the vibrant contrast between delicate color change sapphires in cushion and oval cuts, measuring 11.84, 13.13,10.02 and 7.31 carats, complemented by sapphire, ruby, pink sapphire, color sapphire, black spinel and white diamond, set in 18K white and rose gold. The fluttering feather design evokes the gracious gliding motion of the majestic bird in flight, while color change sapphires embody the flamingo's mythical essence, lifting the imagination beyond earthly beauty. Les Gouttes de Charisme (Josef Albers): Referencing Albers' interwoven aesthetics, this series projects a multi-dimensional effect through extensive layering, while reciprocal reflections between 18K white gold and a 5.3-carat princess-cut white diamond along with white diamonds in cushion, baguette and round cuts intensify the dreamy ambiance. Eyes are drawn to a curtain of exquisite diamonds that undulate like gentle raindrops, insinuating a sense of temporality into the illusion to highlight the charismatic presence. Since 2010, Chow Tai Fook has enhanced the creativity and artistic elements of its jewelry. The auctions of high jewellery masterpieces held in Beijing and Hong Kong have demonstrated to the world its boundless creativity, superlative craftsmanship and wealth of top quality gem stones. In November 2016, selected guests will have the opportunity to participate in an auction gala dinner in Hong Kong, where they may bid for their favorite items. Chow Tai Fook Jewellery Group Limited (Stock Code: 1929) is a world-class leading jeweller listed on the Main Board of The Stock Exchange of Hong Kong in December 2011, and has become the largest jeweller listed in Hong Kong by market capitalisation. The iconic brand "Chow Tai Fook" of the Group has been widely recognised for its trustworthiness and authenticity, and renowned for product design, quality and value. The acquisition of Hearts On Fire, an internationally acclaimed U.S. premium diamond brand, in August 2014 has further underpinned the Group's stature as a diamond expert in the industry.